Ms. Perroni made her professional opera debut with Opera Philadelphia, singing the role of Doris Parker in Charlie Parker’s Yardbird, at the legendary Apollo Theatre in New York City. She reprised the role in her English National Opera debut, in the summer of 2017. This past season Elena made her role debut as Violetta in Verdi’s La Traviata for West Australian Opera. She will revisit the role next season in her debut at the Sydney Opera House. In addition to her recent successes on the operatic stage, Ms. Perroni is quickly making a name for herself in the concert hall. In 2017, she made her Philadelphia Orchestra debut singing selections from Dvorak’s Rusalka. She returned to the Philadelphia Orchestra this past summer in a concert featuring selection from Eugene Onegine in the role of Tatyana, and will return later this season for Nuits d’ete. Other concert engagements include Mimi in La Boheme with Quad Cities Symphony Orchestra, Juliet in Tchaikovsky’s Romeo & Guliet with the New Jersey Symphony Orchestra, Sister Constance in Poulenc’s Dialogues des Carmelites with West Australian Opera, Maria in Leonard Berstein’s West Side Story, with the Reno Philharmonic. 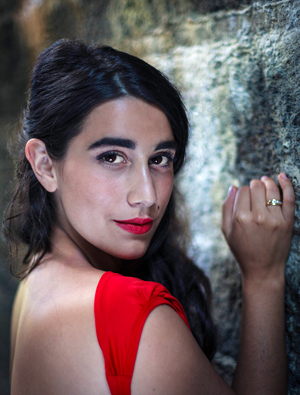 Ms. Perroni is a recent graduate of the world renowned Curtis Institute of Music, where she has performed many leading roles including Adina in Donezetti’s L’elisir d’Amore, the title role in Massenet’s Manon, Anne Truelove in Stravinsky’s The Rake’s Progress, Susanna in Mozart’s Le Nozze di Figaro, as well as Lauretta Puccini’s Gianni Schicchi, and Magda in La Rondine. Ms. Perroni has also performed the leading roles of Mimi in La Boheme and Gilda in Verdi’s Rigoletto at the Chautauqua Music Festival. In 2018 Elena was both a NY regional winner in the Loren L. Zachery competition, and a semi finalist in the Belvedere Competition.